Drinking and driving isn't the most rational thing to do. It's a bit like smoking or a lot of other activities, come to think of it. We all know it's dangerous. We all know that people can end up seriously injured or worse. Still, they keep doing it. The problem is, of course, that drinking causes irrational thinking and behavior. In short, people think dumb thoughts and end up doing dumb things. So, before that happens, and while we are all thinking clearly, let's take a look at the penalties for a DUI in Iowa. 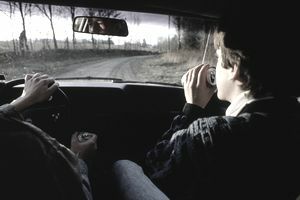 Iowa is an "implied consent" jurisdiction, which means that any person who operates a motor vehicle within the state's borders has implicitly agreed to submit to a blood and/or urine test to determine the presence of drugs or alcohol in the body whenever a law enforcement officer has reasonable grounds to suspect the driver is operating that vehicle under the influence. Refusal to submit to such a test will result in a one-year license suspension for a first offense and a two-year license suspension for subsequent offenses. There are two distinct types of penalties in Iowa associated with OWI: administrative/court-ordered and criminal. Both may be imposed on a driver in regard to an OWI finding. Administrative penalties concern driver's license revocation due to the failure of a chemical test. Court-ordered penalties are imposed upon conviction in a court of law if the offender's license has not otherwise been revoked through administrative penalties. First offense: 180-day license revocation. Offenders 21 years of age or older may apply for a temporary restricted license. Those between the ages of 18 and 21 must wait 60 days after the effective date of sanction to apply for a temporary restricted license. Drivers below the age of 18 cannot apply for a temporary restricted license. If the BAC level was .10% or above, or an accident occurred in regard to the OWI, an ignition interlock device must be installed at the offender's expense in order to receive a temporary restricted license. Second offense, or one or more license revocations within the past 12 months: One-year license revocation. The offender may be eligible for a temporary restricted license 45 days after the start of revocation. An ignition interlock is required for one year from the date of license reinstatement. Third offense: Six-year license revocation. Offenders may apply for a temporary restricted license after one year. Ignition interlock required. Any level of offense involving personal injury: One-year license revocation in addition to any other revocation period. Any level of offense involving death: Six-year license revocation. Driving while license is revoked: $1,000 fine and possible vehicle impoundment. If a driver is convicted of a second or subsequent offense of driving while his or her license is revoked, the vehicle driven at the time of the offense will be seized and forfeited to the state. Present proof of completion of drunk driver course. Present proof of completion of substance abuse evaluation and treatment or rehabilitation services. Comply with ignition interlock requirement and/or financial responsibility law, if applicable. First offense: $1,250 fine and jail time of a minimum of 48 hours to a maximum of one year. The judge may waive up to $625 of the fine if there were no resulting personal injuries or property damage. Community service may be substituted for all or part of the fine at the court's discretion. The defendant must also complete a substance abuse evaluation and treatment course. Second offense: $1,875 to $6,250 fine and a minimum of seven days to a maximum of two years in jail. The defendant must also complete a substance abuse evaluation and treatment course and, in some cases, a substance abuse prevention program. Third or subsequent offense: $3,125 to $9,375 fine and a minimum of 30 days to a maximum of five years in jail. The defendant must also complete a substance abuse evaluation and treatment course and, in some cases, a substance abuse prevention program. These offenses are Class "D" felonies. OWI resulting in death or serious injury: An OWI conviction that causes death to another person is a Class "B" felony and is punishable by up to 25 years in prison. Victim restitution of $150,000 will also be ordered. The sentence cannot be suspended and the defendant cannot be released on bail prior to sentencing or while the case is on appeal. An OWI conviction that results in serious injury to another person is a Class "D" felony and punishable by up to five years in prison. The defendant may also be fined between $750 and $1,500 and may be ordered to pay restitution to the victim. Restitution: In addition to the above criminal penalties, the defendant may be required to pay restitution to victims for damages as well as up to $500 to public agencies for costs incurred as a result of the defendant's crime.